Pumpkin pie, apple cobbler, cranberry pecan bread with a sweet cinnamon brown sugar topping...Fall tends to not only bring about a change in weather, but it also brings about a plethora of warm, sweet, delicious, not-too-healthy-yet-too-yummy-to-pass-up desserts. Everyone deserves a little treat once in awhile as to prevent any scary sugar-hunt stampedes. These treats can still provide you with the comforting essence of Fall without taking a major toll on your figure! Pumpkin seeds are a perfect Fall-y ingredient to incorporate into your Autumn snacking and desserting. They provide you with important nutrients such as magnesium and zinc, and they are even a source of healthy omega-3s. Add a touch of sweetness to these bad boys and you have a perfect, good-for-you snack that'll satisfy your sweet tooth and the infamous salt tooth that tends to follow. This little treat will also keep your hunger down as an added bonus! Here is my recipe for Roasted Maple Pumpkin Seeds to get you through those moments of sugar-desperation ...just don't eat the whole batch! Preheat the oven to 300 degrees. Cover a metal baking sheet with foil. 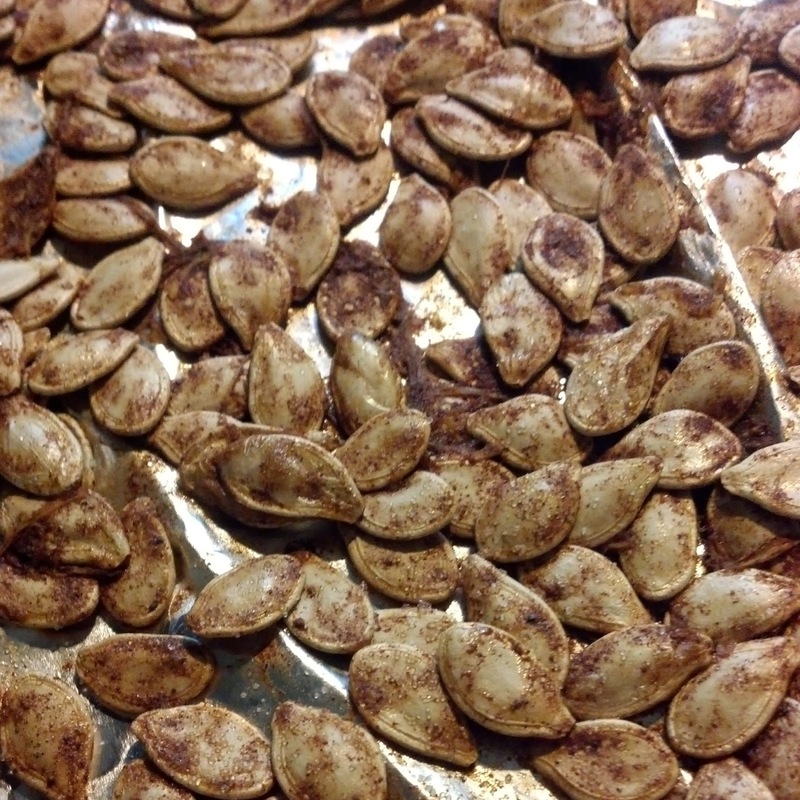 Scoop pumpkin seeds out of the pumpkin. Don't worry about some of the strands and pumpkin juice that come out with the seeds - they add to the flavor! In a bowl, mix together the seeds, maple syrup, cinnamon, and nutmeg. 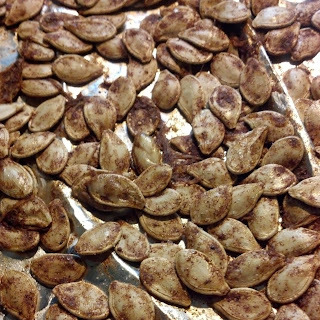 Once all of the seeds are coated, spread them in a flat layer onto the baking sheet. Lightly sprinkle all of the seeds with salt. Bake the seeds in the oven. I didn't time this, but once the seeds are thoroughly dried and crispy, they are all done!